Enriched with Pure Gold leaves and precious Herbal Oils & extracts, this facial kit is extremely effective in removing pigmentation marks and skin blemishes. It also provides radiance and softness to the facial skin. 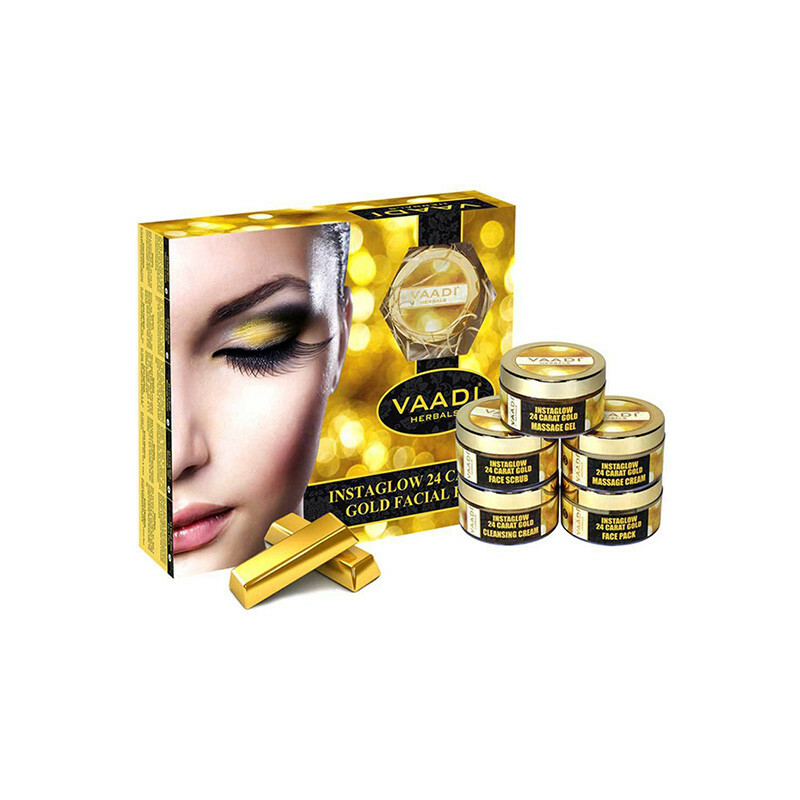 Vaadi herbals facial kits products provides radiance & softness. GOLD CLEANSING CREAM-Pure gold leaves, along with precious herbal oils & extracts, penetrates deep down, to cleanse away all dirt & impurities from the skin's surface, while maintaining the moisture balance of the skin and GOLD FACE SCRUB-This delicate scrub penetrates deep into the skin, & effectively exfoliates & detoxifies the facial skin. It also provides radiance & softness. GOLD MASSAGE CREAM-richly designed cream makes your skin soft & supple, thus reducing fine lines & wrinkles. GOLD FACE PACK-extra-ordinary face pack rejuvenates the skin & improves skin's elasticity. It also removes pigmentation marks & blemishes & reduces skin ageing.it is gives you a best result and makes your skin smooth and soft supple.